A fracture is a break in one or more bones. They can be Avulsion type fractures (small piece of bone), stress type bone fractures, or dislocation with multiple bone fragments in pieces. There are 26 bones in your foot, any of which can be fractured or break depending on the activity level and the position of your foot during the injury or fall. In many cases, but not all, they are sports injuries. Stress Type fractures in a normal bone usually are due to increase load on a bone. Stress fractures are common in runners, however they can happen to anyone that increases activity in a short period of time. You may experience throbbing and swelling in your foot especially at night or at rest. 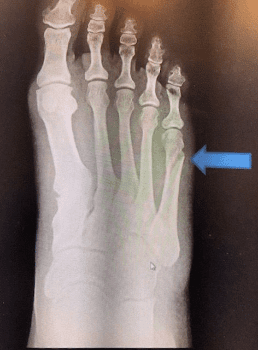 Although this is generally a weakening of the bone, a stress fracture can convert to a complete through and through break of the bone if not treated. Dislocation type Fractures can occur after a fall, during sports or high impact activities. Immediate signs will be inability to bear weight, pain, bruising and swelling. A dislocation fracture is when one of the pieces of the broken bone shifts out of place. If not given medical care, the broken bones may not heal or it can heal in a poor position. How do I know if I have a fracture? What are the Signs and Symptoms? If you felt a pop or snap at the time of injury, and have significant pain to an area with increased swelling, bruising and you are unable to bear weight. How are Bone Fractures Diagnosed? You will initially need x-rays to diagnose a fracture. MRI or CT scan may be indicated for surgical planning. 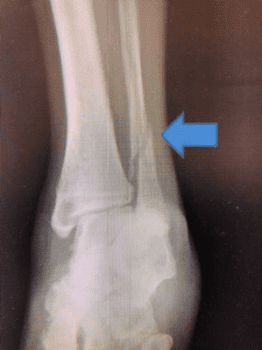 What is the Initial Treatment for a Fracture? Initially it is recommended to rest, elevate, ice and compress the area with ACE bandage. Anti-inflammatory medications might be useful to control pain levels. How Will I Know if my Fracture will Require Surgery? Not all fractures will require surgery, depending on the bone that is broken, your Foot and Ankle doctor at Foot, Ankle & Leg Vein center will evaluate your foot and ankle, the fracture type and if it is dislocated or not. Depending on the fracture type and the amount of dislocation that is present we will determine if you will need surgery or conservative treatment. What Does Conservative Treatment Consist of? Conservative treatment consists of a cast or walking boot, resting, icing and elevating with compression. What Will Surgery Consist of? Typically depending on the bone fractures, surgery usually requires screws, wires and plates for fixation. Typically, bone heals in about 6-8 weeks and will require no weight on the fractured foot or ankle. If you think you have a fractured bone and would like to find out more about Fracture treatment in Boca Raton & Boynton Beach, trust our professionals to fix your fracture & get you moving in no time. Book an appointment today! Read more about: Ankle Fractures and Lisfranc Injuries.